Roughly once a month, some friends from college (Nate and Amy to be specific) and I get together and have dinner. This month, it was my turn to host and cook and their turn to bring wine. It is a rough life we lead, having to sit down and have tasty food and good company with a glass or two of red wine. I haven’t even gotten to the part where we have to have dessert and coffee yet either. Really, so trying. If by trying I mean delicious and fun. A few months ago, during one of our normal dinners, I told them about the time I made my own pulled pork in the oven. Nate’s face lit up. Pulled pork was then put on the menu for the next time I hosted. 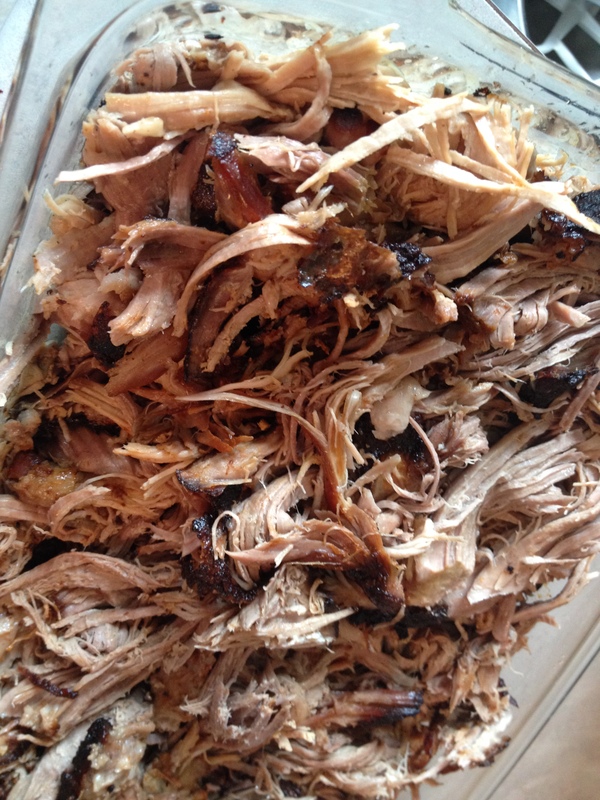 For the record, it takes roughly 1.25 hours per pound of pork shoulder to properly roast it. For 7.5 pounds (the smallest pork shoulder I could find) that is about 9.5 hours. So I slaved and strained over the hot stove…ok fine that is a lie, I put the marinated pork in the oven and went to bed. Upside, I didn’t heat up my whole apartment all day and was able to leave the house and go to lunch out. Downside, I woke up famished and was paranoid all day I smelled like roasting pork. I was assured the smell did not waft off me during the day, I mostly believed them. The results were well worth it, plus this meal truly belongs in the Freezes Beautifully section of my cookbook so leftovers are not a problem! Dessert, now that was something I was so excited for. I mean more so than usual, I am always excited for dessert. Probably close to two years ago now, I pinned this idea for a watermelon cake. 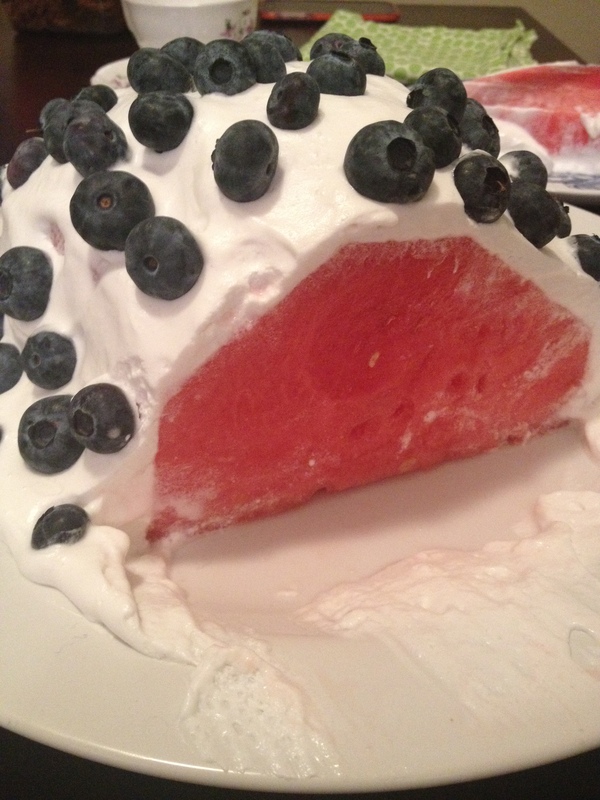 Which really isn’t cake since it is just a watermelon cut into the shape of a cake and covered in whipped cream. I had been waiting for a chance to make it but it is not in the Travels Beautifully section of my cookbook so I had to make it at home. Now Amy is more of a fruit for dessert person and this is her birthday month. Watermelon cake is so her kind of cake. Since Amy and I both are not able to have dairy, I used coconut whipped cream instead of traditional whipped cream. Honestly, I think it wouldn’t have been as good the traditional way! The coconut made it a bit more tropical and refreshing versus a dairy based topping. My Saturday was spent being a 50s housewife wannabe, cooking and cleaning the day away. I got to try new recipes, catch up with friends, and hang out at my house in comfortable clothes. In short, pretty much a perfect day for me!